Fish games lovers and people who like to catch fish or it’s their hobby then Gone Fishing is the perfect game for you infect those who don’t know much about catching fish they will also enjoy playing this game. Gone fishing has many versions released this is the new version they released is Gone Fishing – Trophy catch. Now let’s check this game in detail. In real time fishing you have to wait a so much longer to catch it not so much in this game, fishes come more quickly. A button at the bottom-right of the screen indicates you when the fish in on the hook and you can retract the line. 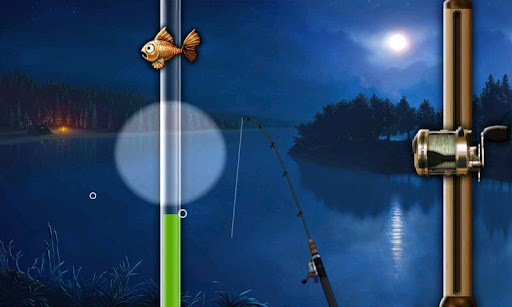 Once you have pushed that button now a little cat and mouse game stars, on the left of your screen there will be a line and fish will appear there moving up and down, there is a spotlight kind of a thing to be using this spot light you have to catch that fish which creates a feeling of pulling the rod back or reeling it. As that line on which fish is moving fully filled, you have caught your fish. After catching the fish its weight will be taken and you can also take the picture of your fish too and you can share this on Facebook to let the people see what you are up to. You can also sell your fish if you want to in return you will get silver coins. The game has been enhanced by taking this in mind the fish catchers loves to explore around the world. 80 different kinds of fish to catch! 9 lures, 11 diverse fishing rods, 24 kinds of bait! Lots of in-game achievements to unlock! Two all-new fishing locations added to Gone Fishing’s striking fishing circuit! More than 50 unusual items to collect!